Finding the right supplier for used car parts Citroën C4 Picasso is not always easy. For lots of customer Bart Ebben proves to be the best partner. In over 35 years we have gained a huge experience as a professional cardismantler specialised in Citroen and Peugeot. Spare parts can be provided for the normal C4 Picasso but for the large MPV called C4 Grand Picasso as well. Because of this specialism we can offer far more than just Citroen C4 Picasso engines and gearboxes. Supplying an airbag, rear seat, wishbone, ABS ESP unit, brake calliper, ECU, front bumper, etc. is just as common for us, along with many, many other parts. 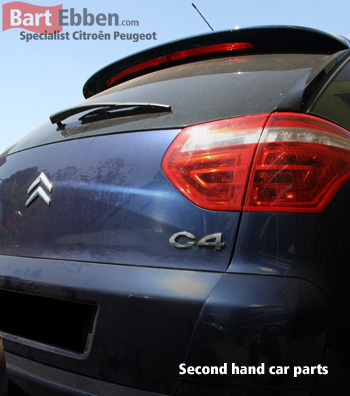 Finding all common Citroën C4 Picasso used car parts is possible from behind your desk in our online catalogue. Prefer ordering by phone? Our salesmen are ready to help you out, or send in a part request. Worldwide shipping of Citroen C4 Picasso used car parts is a daily routine for us. After we have received your part request our salesmen will make sure you order the right Citroen C4 Picasso spare parts second hand or new. After your confirmation packaging will start, this job is taken very seriously and we only ship our parts with selected and highly experienced, automotive shipping companies.